Scattered petals, a mixture of performance, movement and song, an archetypal morality tale … I used to loathe this kind of theatre. It was a bit like modern dance – I found it pretentious; its lack of narrative, dramatic tension and meaning made me anxious. Last night’s performance of The Wild Bride at Kneehigh Theatre’s Asylum venue started out a bit like that. The bride in question’s foolish father makes a pact with the devil but as is usually the case with fairy tales it all happens at lightning speed – the father is tricked almost immediately and before you know it his innocent daughter has been betrayed and left in the woods to fend for herself. I was on the verge of ho-hum territory when I realised I was being drawn in to the magic of the experience. The space itself is enchanting – a nomadic cathedral-like tented structure, consisting of twin half-domes and a vaulted roof – and the performances are captivating – particularly those of the three women playing the bride at different ages, who powerfully express the daughter’s pain, her descent into primordial chaos and her joy. 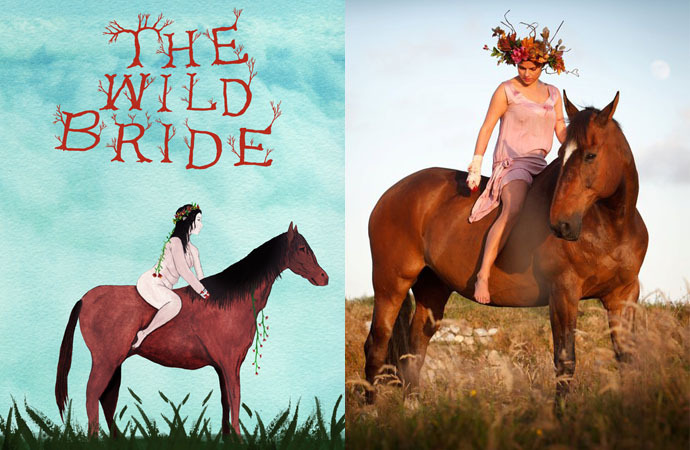 It’s an emotional, rather than a dramatic narrative – an elemental journey to the wilderness and back. And to express that kind of archetypal journey you need a different type of language – not the language of conventional theatre, not discourse, not argument but a somatic language, a language that speaks to our mysterious inner rhythms, what neuroscientist Antonio Damasio calls ‘the music of core consciousness’. I suspect that’s why I used to find modern dance and this kind of performance so problematic – because I couldn’t respond to it with my intellect, my chief modus operandi. But really, who wants to respond to art with the part of their brain that is more at home theorising and debating or the part that would rather be sitting cross-legged in the meditation room? Who’d choose Damien Hirst’s Pharmacy – an installation based on a concept so banal Hirst must have come up with it in the time it takes to dissolve a soluble aspirin in water – over Goya’s The Dog, included in my last post? Accustomed to using my intellect as a defence mechanism it took me a while to find a way to connect with art, rather than trying to appreciate what I thought I ought to appreciate. For me, it was all about letting go of preconceived ideas about what art, dance or theatre should be and discovering what happened when I allowed myself to just take in what was in front of me. I was often surprised by my response. 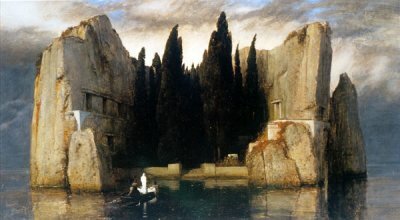 For instance, I’d always thought I preferred abstract to figurative art but Michelangelo’s Pietá in St Peter’s Basilica moved me to tears, and I was so transfixed by Arnold Bocklin’s The Island of the Dead in the Metropolitan Museum of Art I had to keep returning for another look. Letting go of preconceived ideas doesn’t mean you leave your critical faculties at the door. I find much modern dance boring, too cerebral or too concerned with the contortionist aspects of movement and there’s a lot of truly dire physical theatre about, the kind that relies on cheap gimmicks and infantile humour. But there are a few companies who do it well – Kneehigh, dreamthinkspeak, Frantic Assembly – combining design, theatre, music and movement to create a beguiling, mesmerising and visceral experience that can create echoes in places we’ve long forgotten. Last week I visited a Romani caravan. It’s a delightful caravan, charmingly restored (and you can rent it out for your holidays: http://www.ramblingrosecaravan.co.uk/index.html) but as is often the case with long anticipated trips I wanted something more. In this case what I wanted was a connection, a sense of recognition. Because throughout the build up to this visit I’d been thinking of how my father and Aunt Addie used to say we’re descended from Spanish gypsies, and how I want that to be true. You know what I mean by a sense of recognition. It’s the feeling you get when you step off a plane, train or ferry in a country or city you’ve never visited before and although you couldn’t for the life of you find your way to the nearest bar, let alone a post office, something ancient inside you whispers I know this place, provoking a deep yearning that couldn’t possibly come from your own memory. I’ve had it while drinking ouzo and eating a saucer of olives and feta cheese on a step that served as a terrace at a tiny taverna on Serifos but never in Italy or even in France. And I’ve had it in Spain; it’s particularly strong in Spain, that sense of connection (you see where I’m heading with this). Listening to this I can see and smell the dusty sierras of Andalusia, mountain villages as white as aching teeth, the black silhouettes of metal bulls advertising ‘Brandy de Jerez’ standing proud and impotent on dusty hilltops. The boiled dry heat of afternoons, cicadas whirring, everything lizard pale and dry; restless, febrile nights when you might as well drink brandy until morning because you know you’ll never sleep. For a heartbeat or two I feel as if Spain is inside me, offering up a gift from the past. My heritage, my blood! But maybe, just maybe, it’s because I’m in the presence of true duende. It’s duende I’m really after with this longing for a gypsy heritage, in life and in art. I was desperate for a whiff of it in what I call my pre-death years, watching Frida over and over, listening to Chavela Vargas (a Mexican singer who allegedly had an affair with Frida Kahlo and who features in the film), trying to pummel some life and colour into my heart, not realising it was cling-filmed in fear and foil-wrapped in rage. If duende is a struggle, it was more likely there in the search itself, than in the desire to transcend it. It’s also there at the conception of a poem, when the faint wingbeat of an impulse fights to be heard above the din of sandwich fillings and tax returns. If the impulse isn’t shrugged off – and most are – it’s there in the ensuing battle to invoke it in words before it’s wrestled to the ground by the security guards protecting image and reputation, lured to its death by the siren calls of commerce and fame, however small, or mugged by petty thugs like irony and fashion. Few impulses survive, few retain the magic and mystery of their original breath. 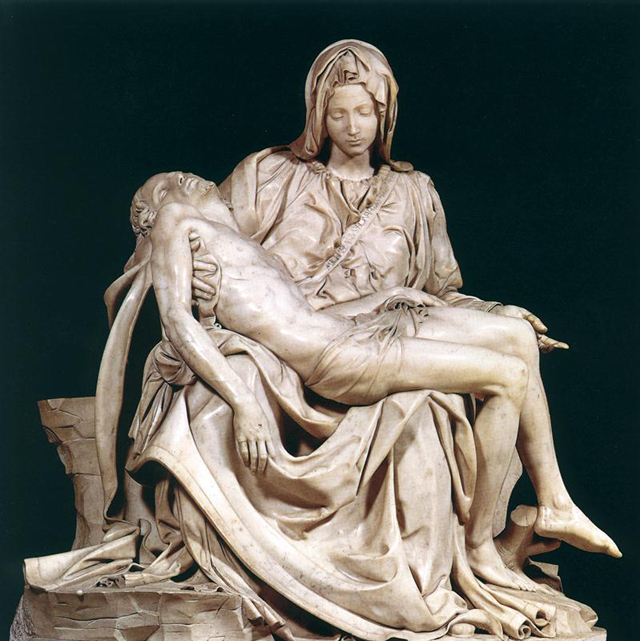 But my guess is that more survive in Spanish art than anywhere else. Because, while Lorca said you didn’t need to be Spanish to be touched by duende, that every art and country is capable of it, he also conceded that the art of Spain, a country where death is a national pastime, is almost always stirred by duende. 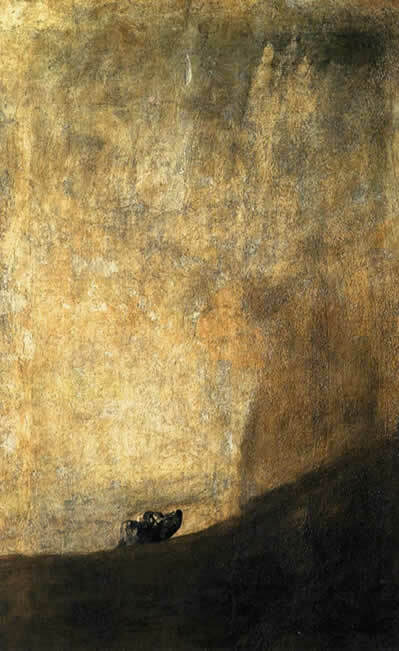 Think about Goya, and in particular the nightmarish image of terror, anxiety, helplessness and despair in The Dog, one of the Black Paintings he painted directly on to the walls of his house in Manzanares, near Madrid. Some years ago, when I was staying in the tiny hamlet of Figols in the Catalan Pyrenees, I visited the ghost town of Aramunt in the nearby Pallars region. Around the middle of the twentieth century the villagers started to leave Aramunt, some of them setting up home in a new town in the valley, but the farming tools and equipment they abandoned in barns and stables makes it look as if they fled, en masse, in a hurry. It gives the place a poignant and uncanny stillness that suggests the spirits of the inhabitants never completely left. One of the first houses I came across was a large stone building in the traditional style, with a stable on the ground floor and living accommodation above. The house was loaded with the same eerie sense of abandonment – the stable floor scattered with hay; a rusty hoe and a contraption with wheels I couldn’t identify propped against the wall. The fruits on a nearby fig tree had been burst open by birds, flesh and seeds splattered on the ground like the bloody remains of a massacre. The door was open and I climbed a rickety wooden staircase to the first floor. It was hot and everything was dusty. I picked my way over rotting floorboards. Apart from an old mirror on the wall the room was empty. I pushed open a shutter to reveal a perfectly formed bunch of grapes hanging outside the window. But for this one bunch the rest of the vine was bare. 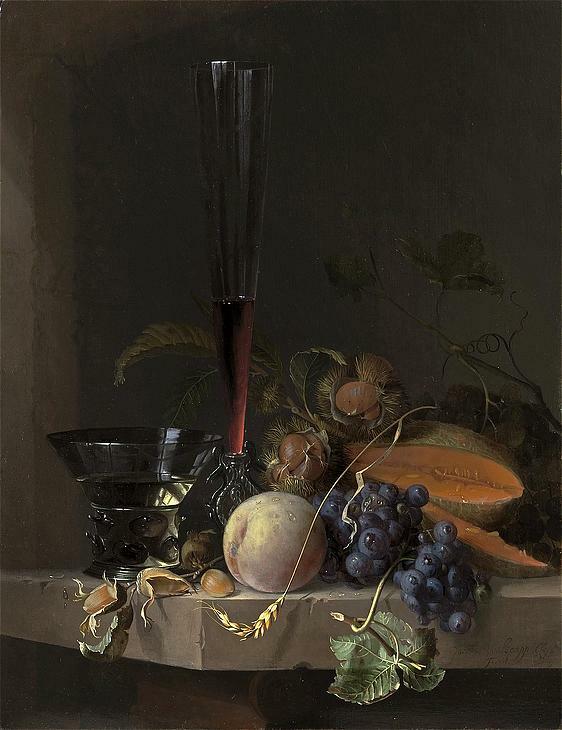 The grapes were ripe and veiled with dust; they were the colour of twilight. I longed to eat one of those grapes but I couldn’t bring myself to ruin the symmetry. Also, I was afraid. Taking a grape would have been like plucking an eye from the house itself and I couldn’t shake off the feeling that the ghosts of the house were staring out from the mirror behind me, watching my every move. A perfect bunch of grapes was all that remained of life in the village; I felt like a trespasser, a rubbernecker at the scene of an accident. I closed the shutters and left. I took a photograph, of course, but it’s nowhere to be found. Still, the image of those grapes haunts me from time to time. I’ve tried to write about them on several occasions but have either been defeated by my inability to provide a literal description of those dusky grapes and the awe they inspired in me or killed them stone dead by burdening them with symbolism and meaning. So I thought I’d try letting them be what they were – a dusty bunch of grapes in the Catalan Pyrenees, in a town where your voice echoed by the well and you entered the churchyard through a gothic wrought iron gate laced with the brittle branches of a dead rose bush, like the fingers of the souls who didn’t quite make it grasping at the gates of heaven. One of my readers accused me of taking an easy swipe in last week’s blog, when I said my soul had as many sides as a Liberal Democrat in a hung Parliament. She’s right. On the one hand I was pushed for time – my mind went into lockdown and I couldn’t think of another multi-faceted character. But mainly I wanted to get a laugh. See, I’d just owned up to believing in the soul and felt compelled to clothe the nakedness of that confession in a laugh, however glib, out of date and, frankly, cheap. It’s a compulsion, a nervous habit, a tic. Over the years I’ve been challenged by practically all of my many therapists (what can I say, I kept believing I was cured) about my tendency to laugh things off. You don’t take yourself seriously, they told me. You’re diminishing your experience and your emotions, negating the past, they said. At least, that’s roughly what they said. My memory’s not all that hot so I don’t remember the precise words but the impression I came away with was that laughing at myself was a bad thing, making light of my feelings was a bad thing. Never one to do things by halves I started to take myself so seriously I could have written a thesis on ‘The Trouble with Lorna’. Talk about self-obsessed, I couldn’t burn toast or mislay a set of keys without turning it into an opportunity for a spot of self flagellation, aka analysis. To try and remember precisely why my therapists gave laughing at myself such a bad rap, I checked it out online when I started writing this post. I discovered that, far from being a sign there’s something seriously wrong with you, laughing is good for your health. 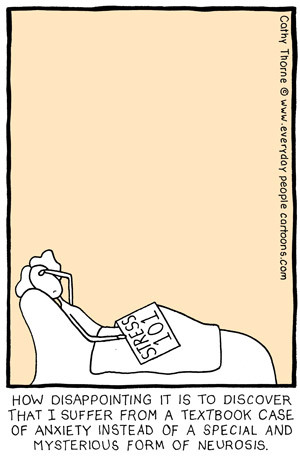 Apparently, it relaxes your body, boosts your immune system, releases loads of happy little endorphins and protects your heart. It’s also an effective defence against life’s traumas and less dramatic but more persistent problems like embarrassment and insecurity. That was it – my tendency to laugh things off was described as a defence mechanism against feelings like pain and fear. Back then, when you went into therapy to expose the demons you’d shoved beneath the carpets of your immaculate house, defence mechanisms were bad guys. But times change and in the days of positive psychology, happiness theories and managing the messy old emotions that get in the way of being in full control of every aspect of your life, they’re the guys you want on your side. What’s more, laughter – even at one’s own expense, especially at one’s own expense – is considered a mature defence mechanism. It turns out joking about a trauma or disappointment is one of the best ways to get through it. All of which is great but I’m wary about things that are alleged to be Good For You (been there, done that, I was the bore taking her own oatcakes and elderflower cordial to a dinner party because she was convinced she had a wheat allergy and that wine was giving her a yeast infection). In fact, I’m wary of attaching the word health to anything – healthy relationships, healthy food, healthy work-life balance – because it assumes some norm, some gold standard by which we should all be able to measure how we love, eat and work. As archetypal psychologist James Hillman insists, it also demonises our symptoms, seeing our depressions, anxiety and guilt as the enemy, something we need to get rid of or overcome. 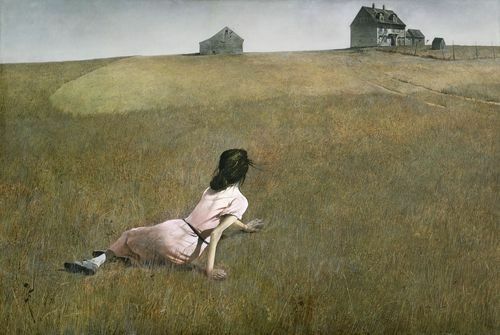 Hillman treats symptoms as manifestations of soul – rather than try to cure them, he suggests, we should examine them with curiosity and interest. Rather than laughter as medicine, then, how about thinking of laughter as the soul at work? (See how easily I’m handling the notion of soul this week? Before you know it I’ll be channelling universal energy and calling myself an earth angel.) Because we all know laughter can be cruel as well as joyous, is used to ridicule and scorn. Who hasn’t laughed at a bad taste joke or had an outburst of inappropriate giggles? I don’t imagine the health police are referring to these types of laughter just as I don’t see them giving the thumbs up to the altogether dirtier laughs you’d get on a girls’ night out or, in the good old days, at a Bacchanalia. Now, I’m no stranger to shedding a tear or two in an auditorium – and I don’t mean the obligatory blubber at the end of La Traviata. I cried at the Bolshoi when the curtain went up and before even one satin-slippered foot had clip-clopped across the stage. I cried when Leonard Cohen sang ‘Famous Blue Raincoat’ at the Brighton Centre a couple of years back. There’s more but this isn’t a competition – if it were I’ve clearly lost hands down to Abramovic who stood up from her chair and burst out crying. You have to admire that level of conviction, the ability to be so in the moment you respond without a second’s thought. Needless to say my own crying was more of a silent snuffle and although I owned up to it later, on both occasions I dabbed my eyes surreptitiously, afraid of being caught out. Unabashed crying aside, what struck me about the quote was Abramovic’s easy use of the word ‘soul’. I don’t know about you but it’s not a word I throw around lightly. And I suspect I’m not alone. Is it, do you think, the case that these days the only people who can refer to the soul without quarantining the word in inverted commas are performance artists and musicians? You might imagine that poets, who surely spend a good deal of their time contemplating the soul’s journey through life, would be comfortable handling the world. Well, not this one. One side of the problem is that science – and neuroscience in particular – has pretty much killed off the soul, dismissing it as a mere object of human belief. The other side of the problem is that ‘soul’ has become devalued by the crystal-gazers who want to dismiss science and have us all healing our wretched selves with visualisations and medieval poultices. Try googling ‘poems about soul’, for instance, and you end up in chicken soup country, with lots of poems for the soul, lots of ‘inspirational’, soul-food, healing poems to nourish the soul. I did use the word in a poem once. 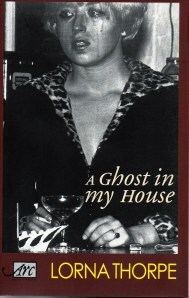 In A Ghost in my House there’s a poem about having a Chinese meal with black marketeers in Moscow, which starts, ‘They lecture us on the soul, Sergei and Igor’. Well, they were Russian, they could get away with it. Writing the collection I’ve just finished there were plenty of times I could have said ‘soul’ but it stuck out like a belly dancer at a funeral, drawing the wrong sort of attention to itself. I love this idea, that souls are made through what we do, how we live. I love it, and yet it also trips me up. It brings out my inner performance artist who wants to make a ritual out of making cup of tea; who thinks being soulful is floating around the garden, plucking at daisies in a crêpe de chine dress; who can’t help but put on a show whenever I stop to observe what I’m doing (applying body lotion to my legs, for instance, she stretches and smoothes as if she’s in a TV ad); and who is only really happy equating soul with a Jungian shadow world of alchemists, herbalists, neo-Platonists and tricksters. 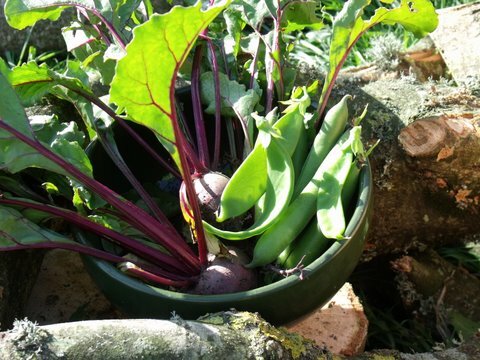 Yesterday I picked three beetroot, eight broad beans and half a dozen mange touts. If you’ve been following this blog from the start you’ll know I’m something of a virgin gardener so forgive my desire to crow about this modest harvest and show you a picture, even though you can’t properly make out the magnificence of the first vegetables I’ve ever grown. Anyway, it got me thinking about growth. See, I might be a novice gardener but I’m no stranger to the concept of growth. Indeed, I devoted several years – and a heck of a lot of money – to personal growth, a period my ex-husband called – rather wittily for him – Project Lorna and which I’ve written several poems about in my forthcoming collection. It started innocently enough. I was commuting from Brighton to London when I started getting panic attacks on the tube and at Victoria Station. Anyone who’s ever had a panic attack knows how frightening they can be – the spacing out, shaking, sweating, pins and needles, the palpitations. For me, everything seems too close and yet a long way away; I feel as if I’m about to unravel from the inside out. The first time it happened I thought I was going mad. The doctor prescribed beta blockers and a short course of counselling. Job done. Then, a few years later, I had a bit of a meltdown and was again referred to a therapist through my GP. That’s when I got hooked. Fifty minutes a week talking about yourself, getting to blame everything on your upbringing, having every scenario seen from your point of view – what’s not to like? Okay, there’s the cost. If I’d saved all the money I spent on therapy and complementary therapists I could have bought a house by now, or at least a terrific wardrobe. Because, in characteristic fashion, I went for it. There’s a great sequence in Hannah and her Sisters where Mickey, the Woody Allen neurotic hypochondriac character, has an existential crisis and experiments with converting to Catholicism and becoming a Hare Krishna. Going to an ashram in India aside (on arrival I discovered the guru had just died of an all too mortal heart attack) I didn’t really touch on the religious end of things. But I attacked the smorgasbord of personal development with all the gusto of a beggar at a banquet, and went on a Viv Nicholson (spend, spend, spend) style shopping spree in the supermarkets of the new age. Acupuncture, aromatherapy, Alexander Technique, chiropractic, counselling, Jungian analysis, cognitive behavioural therapy, transactional analysis, reflexology, autogenics, transcendental meditation, mindfulness – you name it, I dabbled in it. Not forgetting the legion of books promising to help you overcome your addiction and co-dependence and ‘follow your bliss’. But did any of this stuff help me grow? Honestly, I don’t think so. What happened is this; in the quest to become a woman who was calmer, more confident, more caring, more generous, more focused and less irritable, less impatient, I lost myself. The more I delved, the more conditioning and propaganda I found; the more I despaired about my tendency to fantasise, the less authentic I felt. The less selfish I tried to be, the more self-obsessed I became. The more I looked for a purpose, the more meaningless everything seemed. The more I analysed, the more anxious and depressed I became. The question I forgot to ask was: is growth the right aim? Not according to archetypal psychologist James Hillman. For Hillman, growth is for children; after a certain age, it’s cancerous. He sees the human potential movement’s idea of the psyche as naïve, its notion of growth simplistic in the way it presents growth without decay and nature without catastrophes. Where, he asks, is sin, where are viciousness, failure, and the crippling vicissitudes that topple most of us at some point? I’m walking through campus at the University of East Anglia, on my way to see the university counsellor (it’s free and I’m lonely). The UEA campus is grey, concrete, utilitarian. It’s drab and functional, as unimaginative as I’m starting to find the talking cure. The process is too crude, too reductionist. I’ve been analysing my past, my memories, my childhood forever and it isn’t working. Pointing a finger, describing a feeling, finding a cause doesn’t stop me crying over a slice of cake at 4pm but neither does it begin to help me understand the magic of running my finger over the kingdom of frost on my childhood bedroom window, the way a streetlight slanting through a frosted glass door in a basement used to haunt me each night. In Hannah and her Sisters, Mickey tries to kill himself, then snaps out of it while watching the Marx Brothers film Duck Soup. My own lowest point also happened in New York, in a snuff box of an apartment on the outer fringes of the Lower East Side. I was staying with crazy Janine and her leukaemic cat, kept awake all night by the trucks and police cars on East Houston. It was my last day and I’d wanted to go to Greenwich Village but I couldn’t leave the apartment. Instead I watched back-to-back soaps and poured my heart out to the cat. Sadly I didn’t snap out of it just like that – apart from anything the film on the flight home was an inferior rom-com starring Meg Ryan. In fact, it was several years later that I woke up one day and realised that for some time I hadn’t been bugged by the nagging feeling that I was missing the point. Enter your email address here and you'll automatically get an email when I publish a new post.